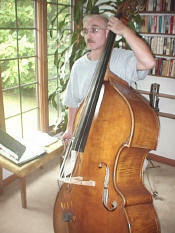 There has been a lot of discussion on the Double Bass List about how to hold the bass. Some people, including some very famous players, advocate standing as it gives freedom of movement and doesn't inhibit the sound of the bass. 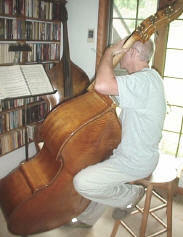 I belong to the school that advocates sitting and using the body to hold the bass. 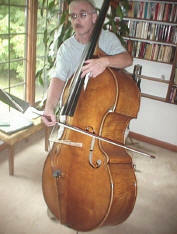 The bass is totally supported by my right leg at the groin, and the very end of my left knee. The left hand plays absolutely no role in supporting the instrument and shifting and moving into thumb position aren't hampered by also having to use the left hand to keep the instrument upright. 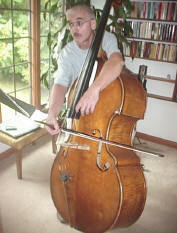 I also don't have to rotate the instrument in order to play at the tip on the B string or at the frog on the G string. 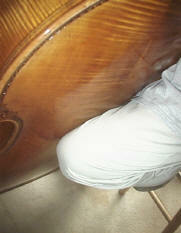 The instrument stays in place throughout its range. 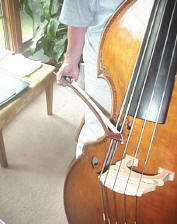 Bow clears leg without rotating bass Knee supports back Even though it looks like the whole leg is on the bass, only the edge of the knee actually touches it.